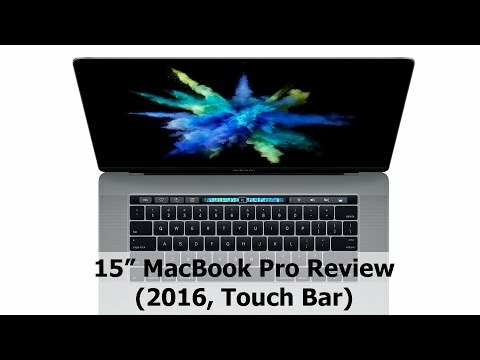 If you own Apple MacBook Pro 15-inch with Touch Bar (2016)(256GB), please do leave your feedback too. The MacBook Pro flaunts a 15.4-inch screen. It features a LED backlit display with IPS Technology bearing a resolution of 2880 x 1800 pixels. Apple’s Retina display is capable of producing vivid images with great detail. In terms of design, Apple has added the Touch Bar to the MacBook Pro 15-inch. The Touch Bar displays virtual buttons to perform tasks like creating message, editing photos etc. A Touch ID sensor is included to authenticate user’s purchases via Apple Pay & secure their device using a fingerprint. The keyboard on MacBook Pro is superb with tactile feedback. A large trackpad is located just below the keyboard. On the audio front, Apple has installed Stereo Speakers with High Dynamic Range that produces immersive sound experience. There is a headphone + microphone combo jack for connecting any audio accessories. Under the hood, the MacBook Pro 15-inch houses Intel’s Core i7 (6th gen) processor ticking at 2.6GHz. The processor makes this model run faster than the previous ones. Supporting the processor is 16GB of DDR3 RAM clocking frequency of 2133MHz. An AMD Radeon Pro 450 graphics card with 2GB GDDR5 memory onboard lets you do all the graphical tasks like gaming, photo & video editing. This laptop packs a 256GB storage capacity in form of SSD. The MacBook Pro runs on macOS High Sierra. On the battery front, the MacBook Pro has a non removable battery packed with a capacity of 76 Whr. It includes an adapter of 87 W. The battery can lasts up to 10 hours on a full charge. This laptop doesn’t have too many ports. There is a USB Type-C port and four Thunderbolt 3 ports. Bluetooth connectivity support lets you to transfer files wirelessly. A WiFi connectivity lets you connect the device to the internet. Dimension-wise, the MacBook Pro is the slimmest at 0.61-inches. It carries a weight of 1.83 kg. Apple provides 1 year international & carry-in warranty along with AppleCare 2 years extended warranty at an extra cost from the date of purchase.